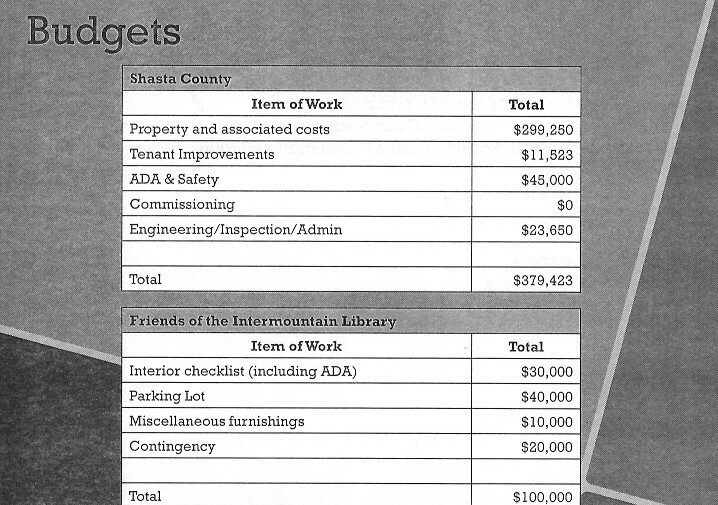 I just want to keep everyone up to speed on the fast approaching climax of five years of preparation by Friends of the Intermountain Library (FOIL) for expansion of information services for the Intermountain Area in a new library building in Burney. 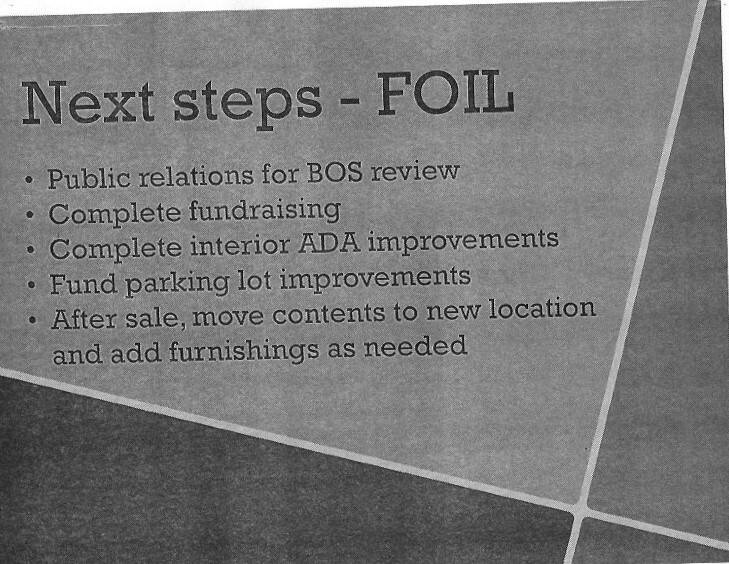 A meeting is being scheduled for FOIL to present their action plan. This meeting will probably take place within the next month and the date will be announced to the public as soon as it is scheduled. 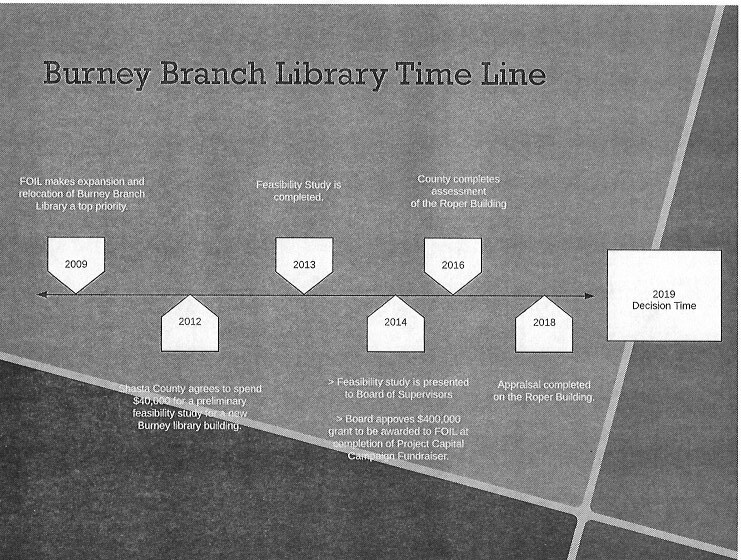 This time the status of the Burney branch of the Intermountain Library and whether the $400,000 grant set aside for a new library will be released may be decided. 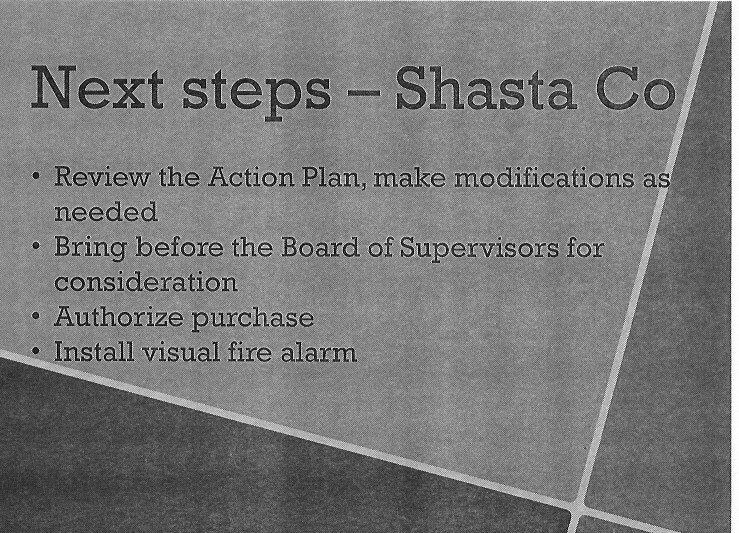 At their last hearing on this issue, the Board of Supervisors voted to make it an action item. If FOIL’s plan is approved the new library building will be almost twice as large. It will have private rooms for tutoring, study, counseling and consultations. There will be a meeting room for community meetings. Rotary has approved $25,000 for a children’s section. There will be more computers with excellent broadband access. 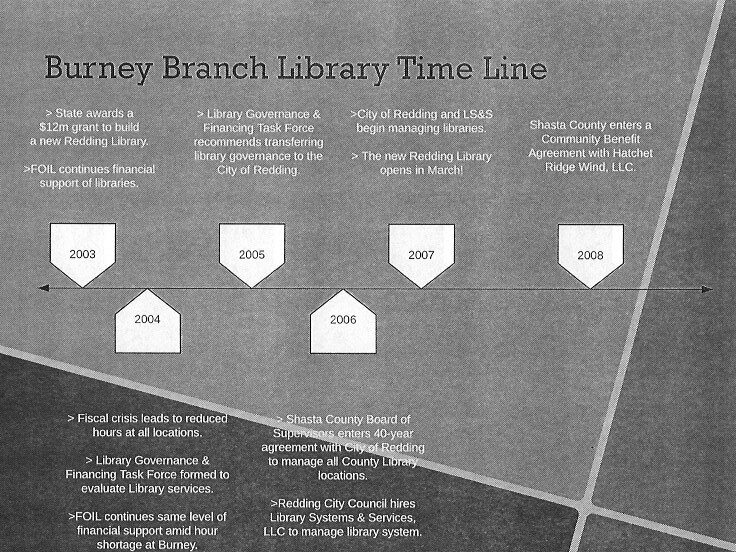 The library will be in a central location on Main Street with ample parking and improved air conditioning and heat. 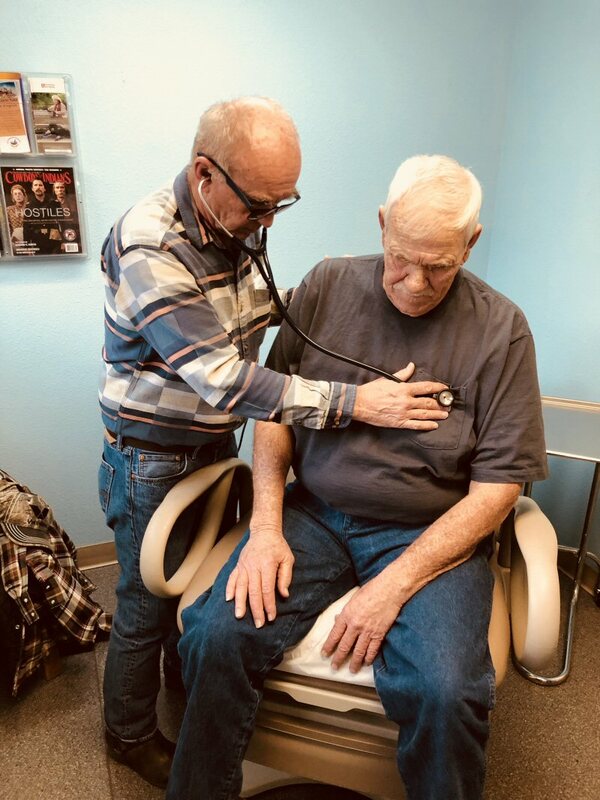 There will be improved services for all citizens of all ages in the Intermountain community and visitors to the area, including some services for veterans and people searching for employment. People will have access to the extensive databases and resources that a modern public library offers. 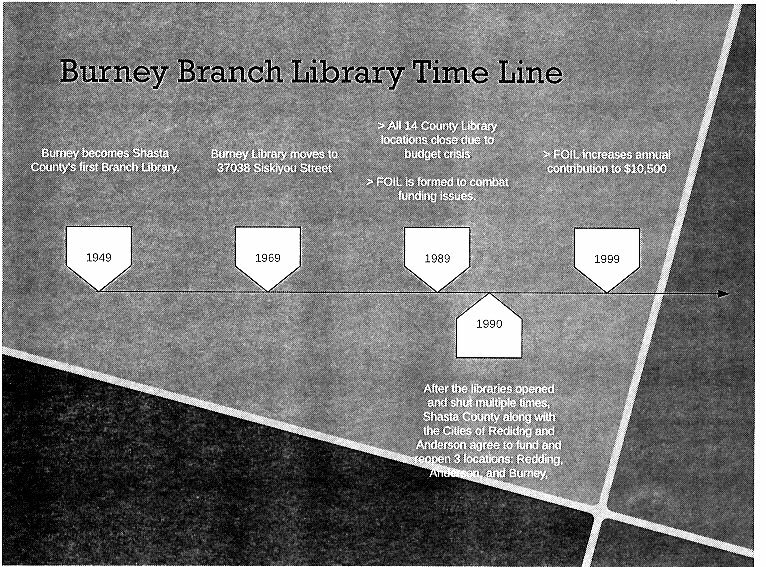 Below are the images from the power point presentation on background history of the library and the FOIL action plan for the purchase and development of a new library building in Burney with improved services for the Intermountain area. 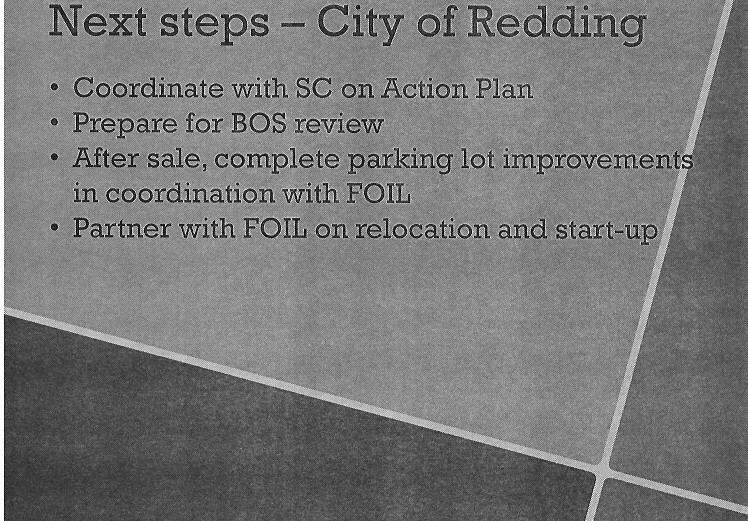 Kim Niemer, Community Services Director for the City of Redding presented the plan at a meeting at the Burney Lions Club on January 22. 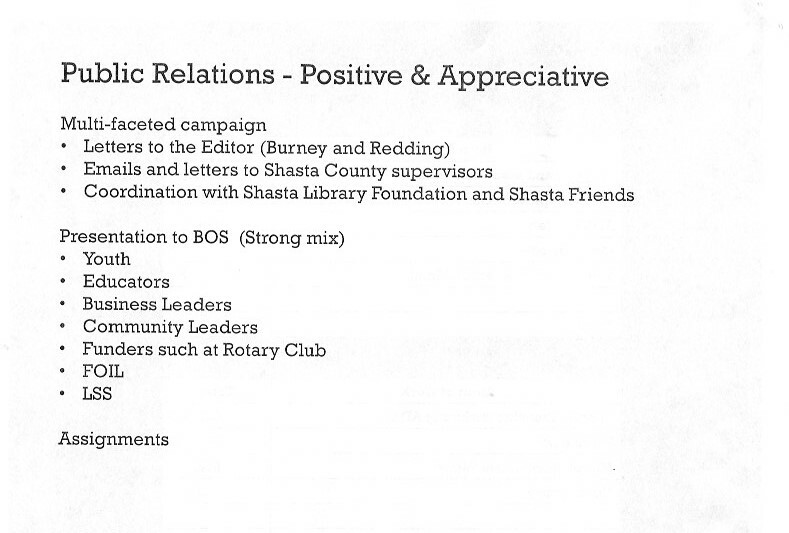 In addition to Emailing the individual Supervisors, you can also send an Email to the whole Board at shastacountybos@co.shasta.ca.us. For more information please contact Pat Pell, FOIL President, 335-7236 or ppell389@gmail.com. Laura began by introducing John 3:16,”For God so loved the world, that he gave his only begotten son, that whosever believeth in him should not perish, but have everlasting life,” as the central theme of Christmas. Then she combined message, testimony, and song to make for a meaningful and delightful evening of inspirational entertainment. 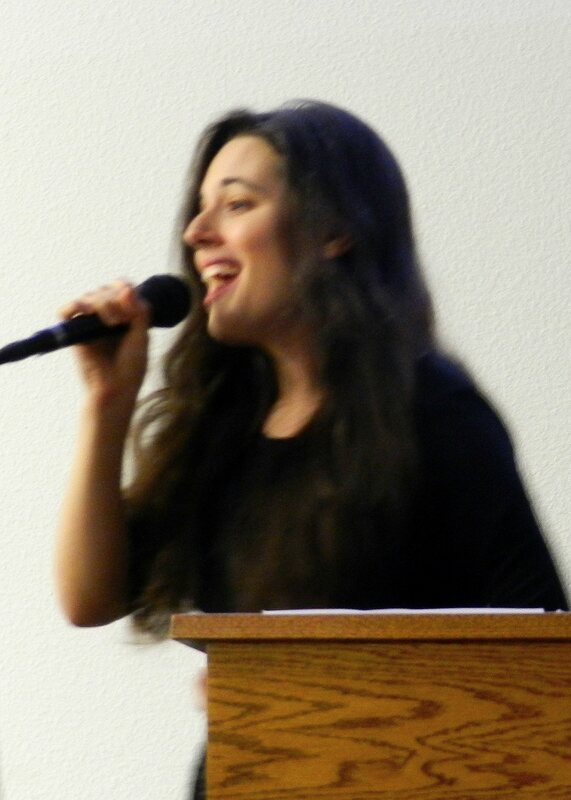 In her clear soulful voice, she sang a variety of Christian songs and carols. She led everyone present in singing “Silent Night.” She shared an original song “All That I Need.” She also sang a version of Leonard Cohen’s beautiful song “Hallelujah!” with new lyrics she had written herself to reflect her personal testimony of faith. After her performance, host Pastor Jerrod Boling shared a 10 minute homily exploring the meaning of the words “Merry Christmas” and “Emmanuel.” We experience the joy of Christmas when we realize and experience that Jesus made it possible for God to live with us in a deeply personal relationship. He encouraged us to read our Bibles daily and affirmed his belief that Jesus is returning soon. Boling is an Iraq War veteran. 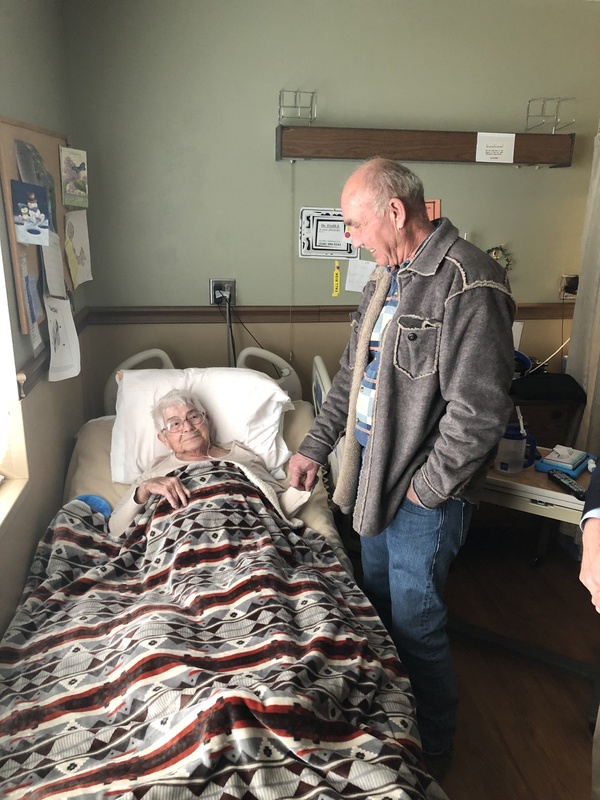 He shared about his experience of Christmas during the war, how much he cherished the opportunities that he had to talk with his wife on the phone, and how she wrote to him every day. This is the kind of longing and intimacy that we should have for God in our lives. After his brief talk, Ms. Williams sang a final song. Then Boling invited everyone to stay for refreshments and closed the program in prayer. Most of the people stayed to enjoy conversation over a meal of veggies, humus, healthy baked goods, cookies, and kale chips (amazingly delicious). The Life Hope Center will be offering a number of Bible studies including the Book of Revelation. In addition they will offer several classes including a cooking class by RN Health Educator Coral Parrish. 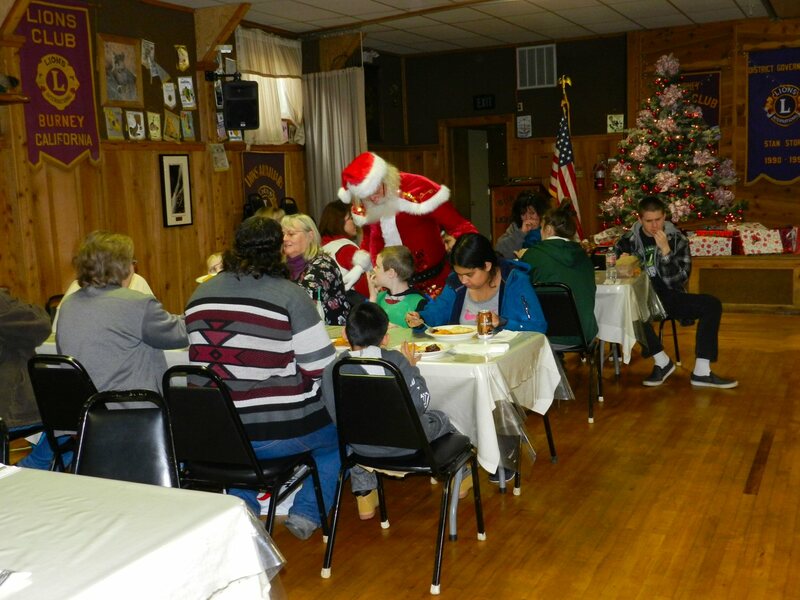 About a hundred people gathered at the Burney Lions Club on Tuesday December 11 to celebrate the Club’s annual Special Needs Christmas Party. 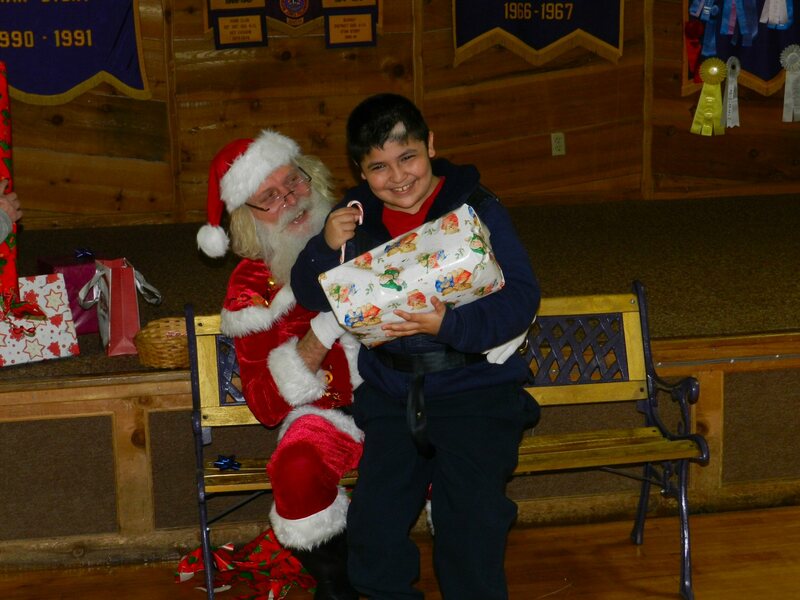 Forty-three special-needs residents from the Intermountain area were invited to meet Santa and receive presents. Family members and caretakers also attended. Every one enjoyed a delicious lunch of baked ham, scalloped potatoes, squash, and cranberry sauce prepared by Lion cooks and served by members of the Lions Auxiliary. 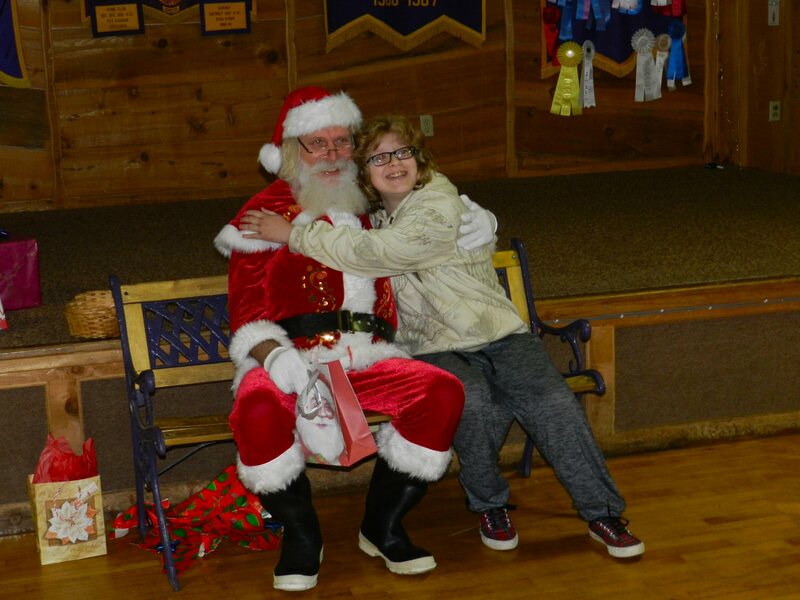 After lunch, Barbara Lane called each special guest forward to meet and greet Santa. Santa gave each person a candy cane and a present that had been purchased specifically for them. 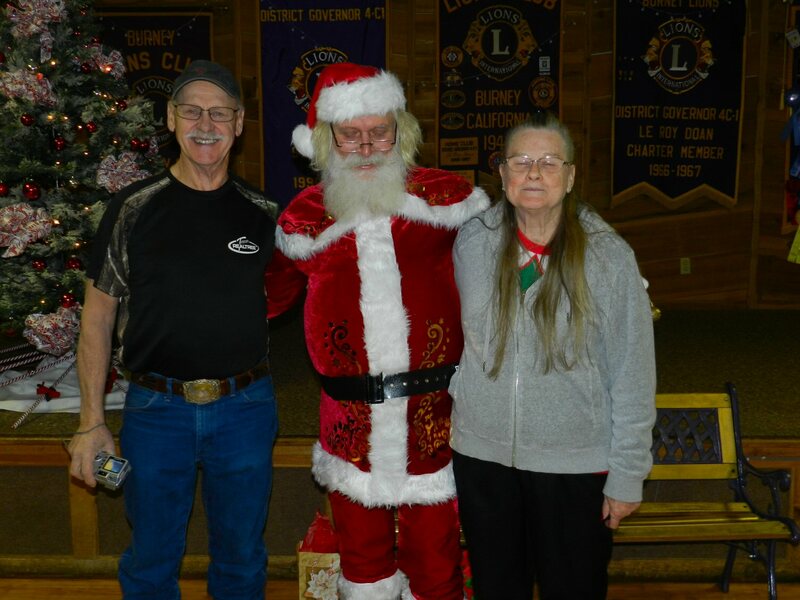 The Burney Lions have been holding this Christmas season event for over 25 years. 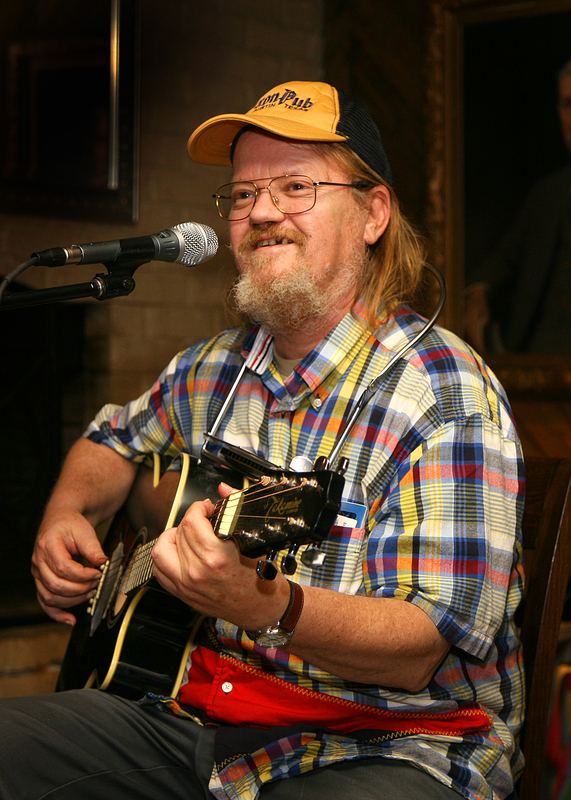 Jim Lane and his wife Barbara organized the event and spent more than a month selecting and buying presents. 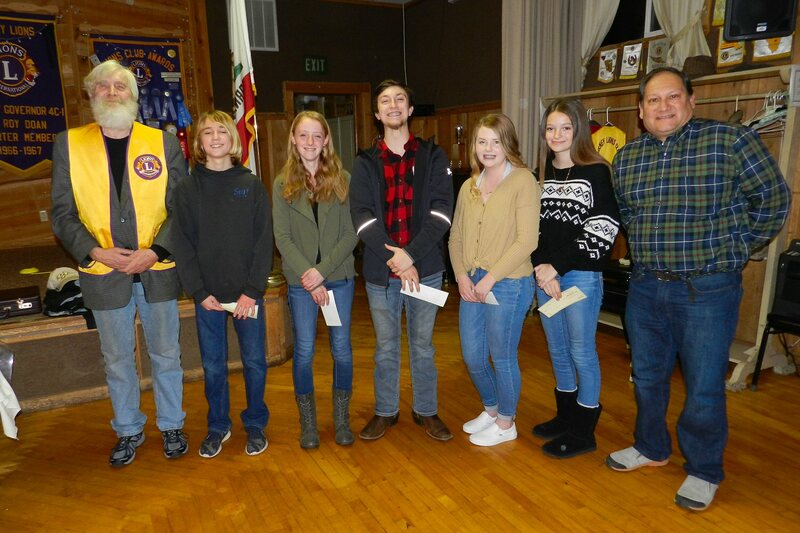 To raise money for the gifts, the Burney Lions and Burney Lions Auxiliary collected plastic and aluminum cans throughout the year. Funds were also supplemented by cash donations from the community. The project is conducted in coordination with Far Northern Regional Center and Shascade Community Services. Burney Water District Customers can now pay their bills by credit or debit card. Customers can make payments online at https://www.burneywater.org/pay-my-bill, by phone, or in person. Enroll in Electronic Billing and Payments to receive your bill and make one-time payments. Customers using electronic billing have an option for paperless billing and instead receive an email advising them that their bills are available to be viewed and paid online. If you sign up for this service, you are not required to pay online and may use one of the other payment options below. If you do not want to enroll in paperless billing you still have the option to make payments online. All electronic payments require a $2.00 processing fee. *All debit and credit payments including online bill pay requires a $2.00 processing fee. Option 1: You will be able to sign up for direct payment in the near future. The District will debit your checking account for the amount of your water bill each billing cycle. The amount of your bill will be deducted from your checking account on the date of your choice. 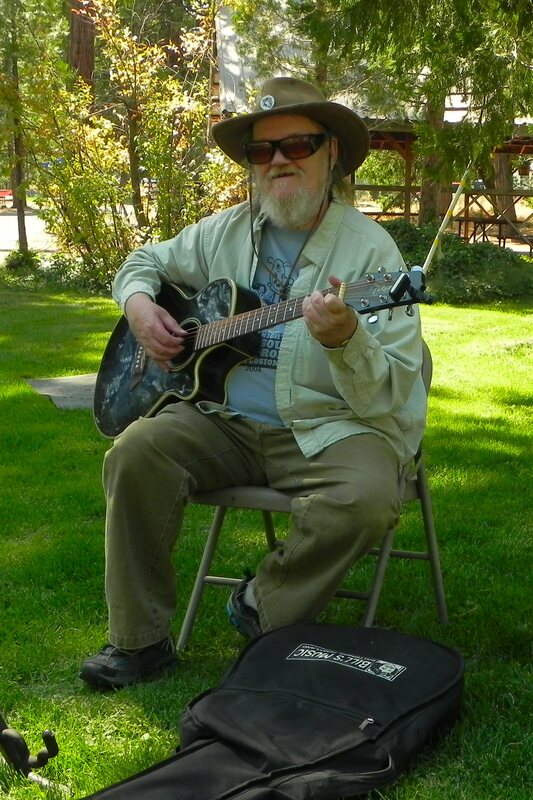 Option 2: Mail the payment and return stub to 20222 Hudson Street, Burney, CA 96013. Allow 5 (five) buisness days for delivery. Option 3: Bring your payment to the District Office located at 20222 Hudson Street in Burney during normal business hours to get a receipt. You may also enclose your check or money order and deposit it into the payment drop box at the District Office during non-business hours. Option 4: Credit and Debit card payments may be made over the phone or in the office located at 20222 Hudson Street, Burney, CA 96013. MasterCard, Visa, Discover Card and American Express are accepted. You can also pay with a debit and credit card online.